Even in the era of modern medicine the occurrence of internal bleeding after operation on the digestive organs frequently presents a formidable diagnostic and therapeutic challenge. Conventional radiographic techniques often fail to indicate the source of hemorrhage. 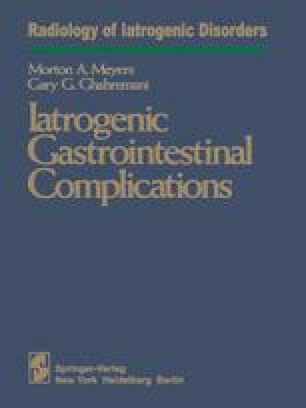 Postoperative examination of the gastrointestinal tract with barium or an iodinated contrast medium may reveal multiple abnormalities, each capable of being the potential bleeding point. The task is made further difficult by the presence of postsurgical plication defects and distortion of anatomic landmarks (1–4). Fortunately the widespread application of arteriography and fiberoptic endoscopy has significantly reduced the number of cases of unexplained postoperative bleeding, often eliminating the necessity for reexploration of the patient (5–8).